The Dannmar D-12/A (formerly Major Series™ D-12A) is a new breed of uncompromising lifts. With a bold 12,000-pound capacity, this lift is ready to take on all the demanding tasks of a professional shop. 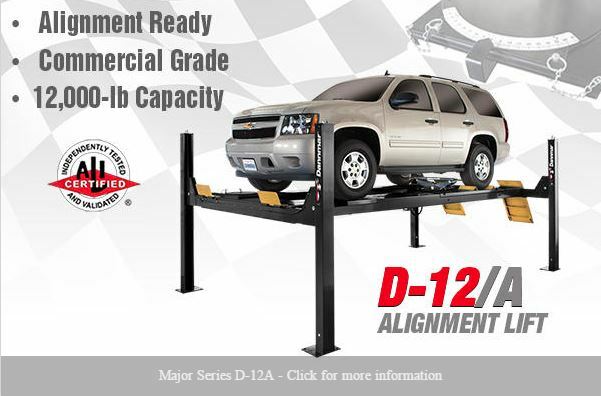 The rugged‐built D‐12/A four‐post alignment lift by Dannmar™ provides a generous 12,000‐lb. lifting capacity and features extended runways to accommodate a wide variety of vehicle wheelbases. Adjustable leveling, recessed front radius plates and integrated rear slip plates makes if fully capable and alignment ready. Compatible with all leading alignment instrumentation, including 3D and camera wheel alignment systems. Durable front radius plates come standard and provide a fast and accurate measurement. Multiple radius plate locations allow you to position the radius plates where best suited to providing better clearance from lift columns or lift front cross beams. 1/2" galvanized aircraft cables for greater lifting capacity. 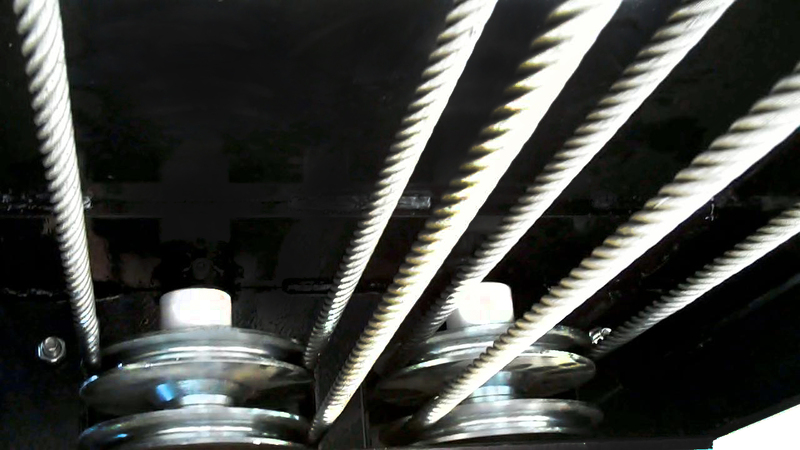 Steel-braided wire, wrapped around a steel core: this is not your typical tire-swing rope. These heavy-duty cables are made to carry the weight of the entire lift, and the load it carries. Built to outlast the lift itself, these sheaves help synchronize the cables so that the lift raises evenly on all four posts. Made of industrial-grade steel, we take pride in our promise of quality - you will find some competitors do not see things the same way. 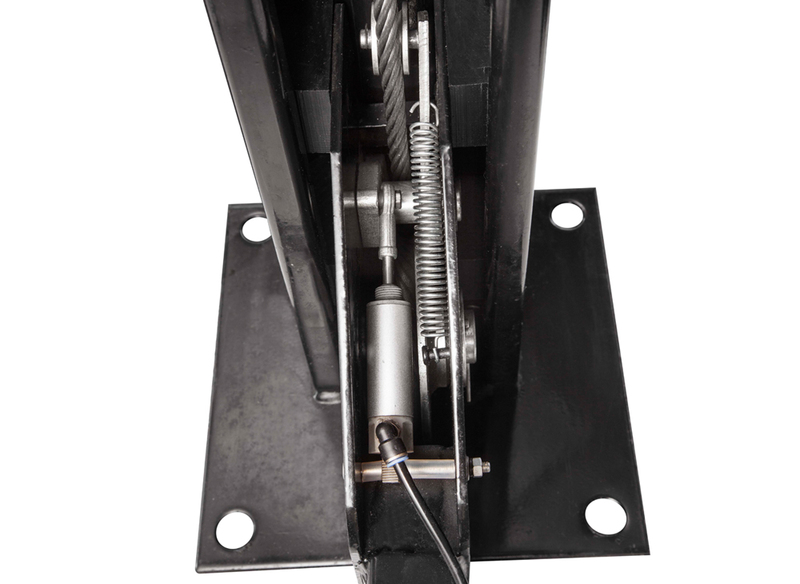 An extra step in lift safety, the steel slack safety-lock mechanism is the third barrier of protection if failure should occur. These have been over-engineered to make the lift an impenetrably safe machine, and will prevent the load from ever coming down unexpectedly. Multi‐caster slip plates in the rear provides precise free‐floating movement to prevent preload of the suspension during alignment procedures. Durable front radius plates come standard and provide a fast and accurate measurement. 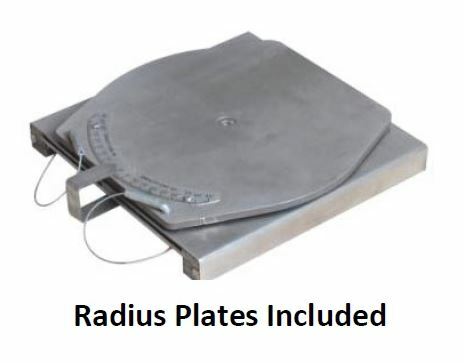 Multiple radius plate locations allow you to position the radius plates where best suited to providing better clearance from lift columns or lift front cross beams. 1/2" galvanized aircraft cables for greater lifting capacity. Equipped with a single hydraulic cylinder hidden away under the runway for maximum performance and reliability and minimum exposure to elements. Also eliminates any opportunity for vehicle door or mirror damage. Integrated hydraulic flow restrictor provides controlled descent in the unlikely event of an unexpected hose rupture. 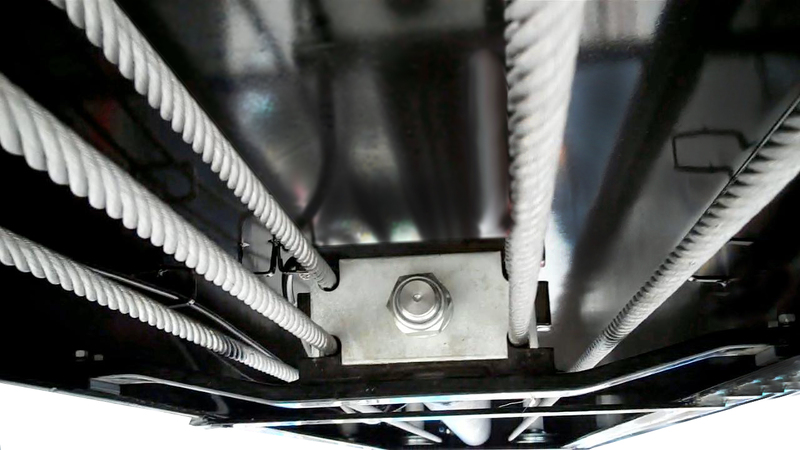 Spring‐loaded safety locks automatically engage continuously during rise. Adjustable safety ladders allow for precise runway leveling even when installed on sloped floors. Features multiple adjustable height locking positions for variable height parking and infinite leveling. Push‐button pneumatic lock release makes lowering operations simple and fast. Equipped with a redundant secondary lock system acts as a slack‐cable device in the unlikely event of an unexpected cable failure. A maintenance‐free electric hydraulic power system assures ultimate dependability. Large base plates provide a solid foundation. Non‐slip runway surface provides maximum grip even when wet or oily. Optional 6000 pound capacity rolling jacks (model DRJ‐6) make a great addition to increase service capacity. DRJ‐6 comes equipped with a commercial grade airhydraulic pump requiring 90‐150 PSI, 10‐25 CFM. L - Min. 4‐Wheel Alignment (**) 66"
M - Max. 4‐Wheel Alignment (**) 168"
N - Max. 2‐Wheel Alignment (**) 175"
* This dimension may be limited with the addition of rolling jacks. *** Special Voltages available upon request. 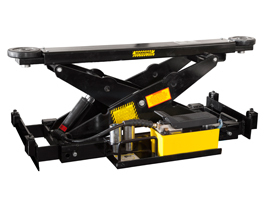 Click the button below to add the Dannmar D-12/A 12,000 Lbs Capacity Alignment Lift to your wish list.